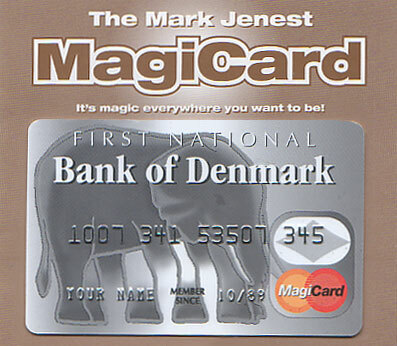 Today, when you order "The MagiCard by Mark Jenest", you'll instantly be emailed a Penguin Magic gift certificate. You can spend it on anything you like at Penguin, just like cash. Just complete your order as normal, and within seconds you'll get an email with your gift certificate. 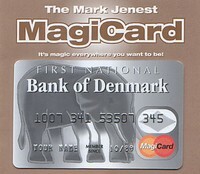 The MagiCard by Mark Jenest It's magic everywhere you want to be. Put these five miracles in your wallet and you'll never be without a trick... actually you'll have five!!! 1. Ask your friends to imagine a color, an animal, and a country. the MagiCard 'influences' them to think of a Gray Elephant in Denmark! 2. Your better half turns your finances upside-down... literally! (Psst! turn the MagiCard upside-down to read the message in the account number). 3. Have them pick a card and shuffle it into the deck. Now reveal their selection in the logo by turning the MagiCard on its side. It's the 8 of Diamonds! 4. Ask someone, "Wouldn't it be amazing if your name suddenly appeared on my credit card?" Look, there it is! 5. A spectator merely thinks of a number--it matches the date on your credit card! If you know me, you know that I love good, powerful, practical magic. This fits RIGHT under my category of good magic... but it only gets 4 stars. This is a good, practical effect as I said; the classic Elephants In Denmark effect, a card force... a few other things all packed in a little thing that you keep in your wallet. Nice idea, and I enjoyed it a lot. I don't know, maybe I am OCD... This is a great trick for a close-up worker, I just think that they should have used a different trick as the main one on the card. This is a pretty good prop to use for this classic trick. If you already know this trick, I wouldn't go and buy the card because I think there are other great ways to reveal it, but if you don't know the trick then pick it up. I did this trick for my math students a while ago and liked it. However, they'll quickly pick up on how it's done, so I find that it's better used as a gag rather than magic. This is an awesome trick with tonnes of material to use! The only problem is, with me living in Australia, people always say Echidna or Emu.... (No Joke). But if you live anywhere else, you'll be fine! 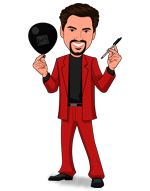 Its a really clever prop, you can do 5 good tricks, i like it, if you have some extra cash get it, its a nice piece of magic. I searched for other same kind of cards, but only this one has an optical illusion. Every time I've done this no one has choosen elephant or Denmark. Also, it takes a fairly intelligent person to think of a country begining with D if they don't know of denmark. This is one of the neatest inventions. All the little things that come on the card are the greatest. I carry it with me all the time.